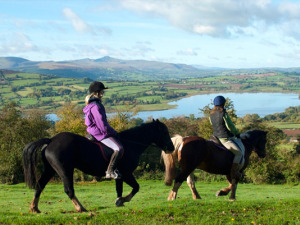 Llangorse Riding Centre0333 600 20 20work Horse RidingOne of the best ways to savour the gentle valleys and beautiful views of the Brecon Beacons, Black Mountains and Llangorse Lake is on horseback. Llangorse is a long established, and family run Riding Centre offering trekking, riding and hacking to suit your experience. Rides are enjoyed on over 25 miles of private bridleways and on vast areas of adjacent hillside. Riding along public roads is not necessary, therefore giving a real sense of freedom and feel for the open countryside; a great advantage and something that is unique to Llangorse Riding Centre. The riding experience can be tailored to suit the age and ability of groups. One of the best ways to savour the gentle valleys and beautiful views of the Brecon Beacons, Black Mountains and Llangorse Lake is on horseback. All rides accompanied by experienced and qualified staff. Our riding centre is WTRA & BHS approved. Open all year. Our on-site cafe caters for everyone, from individuals and families, to birthday parties, schools, colleges and groups. Whether you are taking part in one of our activities, visiting as a climbing member, camping, staying with us in one of our on-site bunkhouses or just passing by - why not pop in for a break? Open all year except Christmas day, Boxing day & New Years day. From A40 turn for Llangorse at Bwlch. Follow B4560 towards Llangorse, turning right after 3 miles at signs.